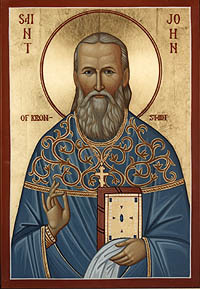 Our righteous father John of Kronstadt (Иоанн Кронштадский; October 19, 1829, in Sura – December 20, 1908, in Kronstadt) was an archpriest of the Russian Orthodox Church. He was born as Ivan Ilyich Sergiyev (Иван Ильич Сергиев) in 1829. From 1855, he served as a priest in St. Andrew's cathedral in Kronstadt. Here, he greatly committed himself to charity, especially for those who were remote from the church, and traveled extensively throughout the Russian empire. He was a member of the right extremist movement Sojuz Russkogo Naroda (Alliance of the Russian people) but did not commit himself politically. He was already greatly venerated at the time he died. He was glorified by the Russian Orthodox Church Outside of Russia in 1964 and by the Russian Orthodox Church on June 8, 1990. 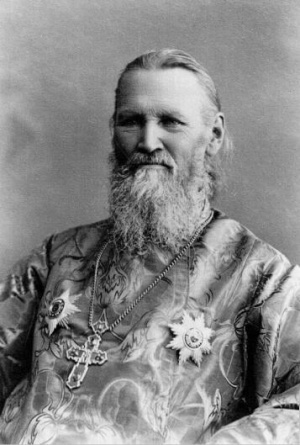 St. John Maximovitch of Shanghai and San Francisco played an active role in preparation of St. John's canonization. Many churches around the world and Ioannovsky Convent, the second largest monastery in St. Petersburg (by community size) are dedicated to St. John of Kronstadt. His feast days are commemorated on December 20 and October 19. "When you are praying alone, and your spirit is dejected, and you are wearied and oppressed by your loneliness, remember then, as always, that God the Trinity looks upon you with eyes brighter than the sun; also all the angels, your own Guardian Angel, and all the Saints of God. Truly they do; for they are all one in God, and where God is, there are they also. Where the sun is, thither also are directed all its rays. Try to understand what this means." "Oh, what great happiness and bliss, what exaltation it is to address oneself to the Eternal Father. Always, without fail, value this joy which has been accorded to you by God's infinite grace and do not forget it during your prayers; God, the angels and God's holy men listen to you." "The enemy of our salvation especially strives to draw our heart and mind away from God when we are about to serve Him, and endeavours to adulterously attach our heart to something irrelevant. Be always, every moment, with God, especially when you pray to Him. If you are inconstant, you will fall away from life, and will cast yourself into sorrow and straitness." "Do not be despondent when fighting against the incorporeal enemy, but even in the midst of your afflictions and oppression praise the Lord, Who has found you worthy to suffer for Him, by struggling against the subtlety of the serpent, and to be wounded for Him at every hour; for had you not lived piously, and endeavored to become united to God, the enemy would not have attacked and tormented you." "Do not fear the conflict, and do not flee from it; where there is no struggle, there is no virtue. Our faith, trust, and love are proved and revealed in adversities, that is, in difficult and grievous outward and inward circumstances, during sickness, sorrow, and privations." "Prayer for others is very beneficial to the man himself who prays; it purifies the heart, strengthens faith and hope in God, and arouses love for God and our neighbor." To reconcile the world and to save our souls! And with the confessors you suffered for Christ! With the righteous you are radiant with the grace of God. And given us your name as a source of miracles. And hear us when we cry out in faith, O our beloved shepherd John! "I will build my church, and the powers of death shall not prevail against it!" This page was last edited on October 23, 2012, at 19:06. This page has been accessed 92,436 times.